Frank Robert "Frankie" Ballard IV (born December 16, 1982) is an American country music singer-songwriter and guitarist. He has released two albums each for Reprise Records and Warner Bros. Records, and has charted four singles on the Hot Country Songs charts. He played college baseball at Mott Community College. He then continued to pursue college baseball by playing in the NCAA with Western Michigan University. Ballard performing at Great River Days, Muscatine, Iowa, July 27, 2013. In the summer of 2008 he signed up for Kenny Chesney's Next Big Star competition. After winning the competition for Michigan in 2008, Ballard also opened shows for Chesney at Michigan venues. He signed to Reprise Records Nashville in 2010 and released his debut single "Tell Me You Get Lonely." The song received a four-star review from Kyle Ward of Roughstock, who praised Ballard's voice and called the song "an above average debut effort." "Tell Me You Get Lonely" debuted at Number 59 on the Hot Country Songs charts dated for the week ending June 12, 2010 and peaked at number 33 in early 2011. On January 7, 2011, Ballard made his debut appearance at the Grand Ole Opry. Ballard released his second single, "A Buncha Girls", in early 2011. This song has also made top 40. Both of his singles are included on his self-titled debut album, which was released in May 2011. Also in 2011, he opened for Lady Antebellum. In 2013, Ballard moved to Warner Bros. Records and released his third single, "Helluva Life". It is the lead single to his second album, Sunshine & Whiskey. It became his first number 1 single in early 2014. Later in the year, the album's title track also went to number 1. "Young & Crazy", the album's third single, also went to number 1. The first single from Ballard's third album, "It All Started with a Beer", was released to country radio on November 16, 2015. The album, El Rio, was released on June 10, 2016. The album's second single, "Cigarette" released to country radio on August 8, 2016. Ballard co-wrote "I Came to Git Down" on Big & Rich's 2014 album Gravity’'. "Tell Me You Get Lonely"
A"It All Started with a Beer" did not enter the Hot 100, but peaked at number 2 on Bubbling Under Hot 100 Singles. ↑ "Frankie Ballard Bio". Frankie Ballard.com. Retrieved February 26, 2013. ↑ "Frankie Ballard Keeps Grandmother's Memory Alive". The Boot. December 16, 2010. Retrieved June 2, 2011. ↑ Keirns, Kristin (May 17, 2011). "Bronco Baseball Alumni Note - Ballard Playing on the Big Stage". Western Michigan University. Retrieved December 29, 2015. ↑ "Frankie Ballard Biography". Great American Country. ↑ "Frankie Ballard kicks off tour with free show at The Intersection in Grand Rapids". Mlive.com. March 31, 2010. Retrieved July 7, 2010. ↑ "Frankie Ballard biography". Warner Music Nashville. Retrieved July 7, 2010. ↑ Ward, Kyle (June 15, 2010). "Frankie Ballard — "Tell Me You Get Lonely"". Roughstock. Retrieved July 7, 2010. ↑ Morris, Edward (June 5, 2010). "Miranda Lambert's "House" Claims Highest Address on Country Songs Chart". CMT. Retrieved July 7, 2010. ↑ Leggett, Steve. "Frankie Ballard biography". AllMusic. Retrieved May 24, 2011. ↑ "Frankie Ballard Album & Song Chart History - Country Albums". Billboard. Prometheus Global Media. Retrieved December 5, 2013. 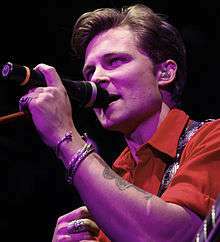 ↑ "Frankie Ballard Album & Song Chart History - Billboard 200". Billboard. Prometheus Global Media. Retrieved February 20, 2014. ↑ "Frankie Ballard Album & Song Chart History - Heatseekers Albums". Billboard. Prometheus Global Media. Retrieved December 5, 2013. ↑ "Upcoming Releases". Hits Daily Double. ↑ "Upcoming Releases". Hits Daily Double. HITS Digital Ventures. Archived from the original on June 2, 2016. ↑ Shelburne, Craig (April 14, 2016). "Frankie Ballard Announces 'El Rio' Album Release On June 10". MusicRow. Retrieved April 14, 2016. ↑ Matt Bjorke (August 9, 2016). "Top 10 Country Albums Chart: August 9, 2016". Roughstock. ↑ "Frankie Ballard Album & Song Chart History - Country Songs". Billboard. Prometheus Global Media. Retrieved December 5, 2013. ↑ "Frankie Ballard Album & Song Chart History - Country Airplay". Billboard. Prometheus Global Media. Retrieved December 5, 2013. ↑ "Frankie Ballard Album & Song Chart History - Bubbling Under Hot 100". Billboard. Prometheus Global Media. Retrieved December 5, 2013. ↑ "Frankie Ballard Album & Song Chart History - Canada Country". Billboard. Prometheus Global Media. Retrieved December 5, 2013. ↑ "Frankie Ballard Album & Song Chart History - Billboard Canadian Hot 100". Billboard. Prometheus Global Media. Retrieved March 6, 2014. ↑ Matt Bjorke (May 8, 2014). "Country Chart News - The Top 30 Digital Singles - May 8, 2014: Brantley Gilbert's Guns N Roses Debut". Roughstock. ↑ "Canadian single certifications – Frankie Ballard – Sunshine %26 Whiskey". Music Canada. ↑ "Nielsen Soundscan Chart". Nielsen. July 11, 2016. ↑ "CMT : Videos : Frankie Ballard : Tell Me You Get Lonely". Country Music Television. Retrieved May 26, 2011. ↑ "CMT : Videos : Frankie Ballard : A Buncha Girls". Country Music Television. Retrieved May 26, 2011. ↑ "CMT : Videos : Frankie Ballard : Helluva Life". Country Music Television. Retrieved December 9, 2013. ↑ "CMT : Videos : Frankie Ballard : Sunshine & Whiskey". Country Music Television. Retrieved September 8, 2014. ↑ "CMT : Videos : Frankie Ballard : Young & Crazy". Country Music Television. Retrieved February 28, 2015. ↑ Betts, Stephen L. (February 25, 2016). "See Frakie Ballard's Dreamy Video for 'It All Started With a Beer'". Rolling Stone. Retrieved February 26, 2016. ↑ "CMT : Videos : Frankie Ballard : Cigarette". Country Music Television. Retrieved August 21, 2016.